I visited family in Central Oregon this past weekend, and had two goals. The first was to take the sun going down over the Cascade mountain range, which can be seen boldly overlooking the flat grasslands. 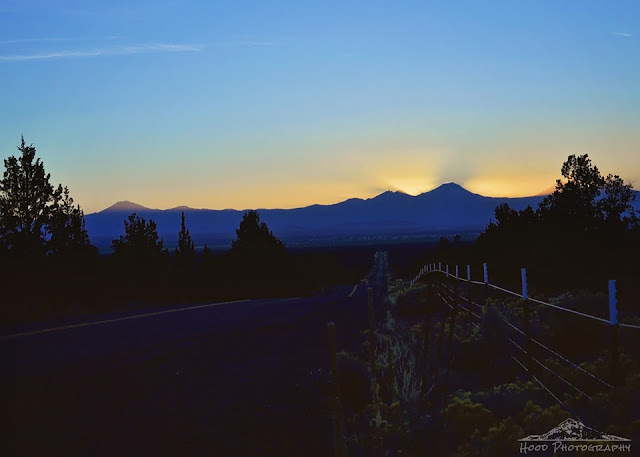 This photo was taken between Prineville and Bend, Oregon. The mountains peaks pictured from left to right are Mt. Bachelor, Broken Top, and the Three Sisters. Hey I was in Central Oregon this weekend too! I hiked up on Mackenzie pass and then to the crater of Broken top. Nice pic! Well, put a big check on that first goal -- beautiful pic! The Cascade range adds so much beauty to the whole region. beautiful with 2 tones of blue. Oh wow...did you have to get up high to get this photo? Amazing. It takes your breath away Sarah... Michelle from Nature Notes..
Lovely light touching the mountain shapes. There is a Three Sisters in the Blue Mountains west of Sydney in New South Wales, Australia. Thank you for sharing at image-in-ing! I hope you'll stop by often & let us enjoy your images.